Used to maintain desired tension on electrified low-tension conductors. 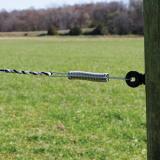 Use to keep rope fences pulled tight. 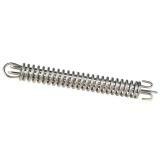 Install a P Spring every 1320 ft.
Easy to use. 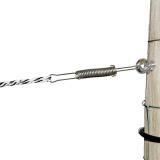 Use with all types of rope conductors. 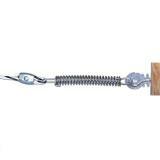 Attach conductor to other end of spring by taking the loose end of conductor and putting it through open end of spring. 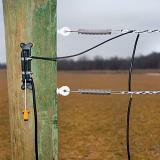 Pull conductor until spring is 1/3 to 1/2 compressed. Run conductor through the loop one more time and tie off. Whenever conductor becomes loose, repeat above steps. 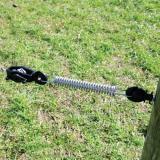 When using electrified rope (any of it), use P Springs and RopeLinks. The goal is to have the P Springs half compressed when everything is all put together. However, if you don't have a helper to hold the tension on the rope, you may lose too much tension in the process of getting the RopeLink wrapped around the rope. Solution: Attach the P Spring to the terminal insulator and loop the rope through it twice. Then pull the rope tight so the P Spring is FULLY compressed. When you get the RopeLink attached, you may have lost some of the tension on the rope, but the P Spring is half compressed just like it should be. Recommended: 29 out of 30 said they would recommend this product to a friend. The springs I received are so stiff and unyielding that I could barely get the compressed half-way and once they were, they just stuck there providing absolutely no spring action whatsoever. They weren't rusty but even a liberal dose of WD-40 provided no benefit at all. They are completely worthless. Amazing value. I am using these as tension springs in my cable and pulley steering system in my 1974 Boston Whaler. Marine SS tension springs cost 10 times as much. They work well. These have worked well for me over the years. 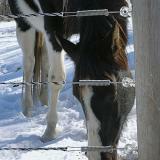 They allow for a 'boxing ring' effect in case your animals crash into the fence, or tree limbs fall on the fence. I think they help prevent insulator breakage in case of accidents. Spring = less equipment breaking . They are strong and I've only had 1 out of 30 break during animal accidents. Building a new paddock so ordered the P-Springs to do it. 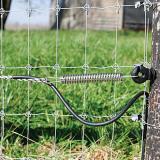 We've used these on all of our paddocks and they work great. 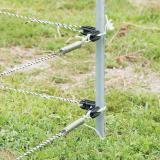 These make fencing so much easier!!! Love them!